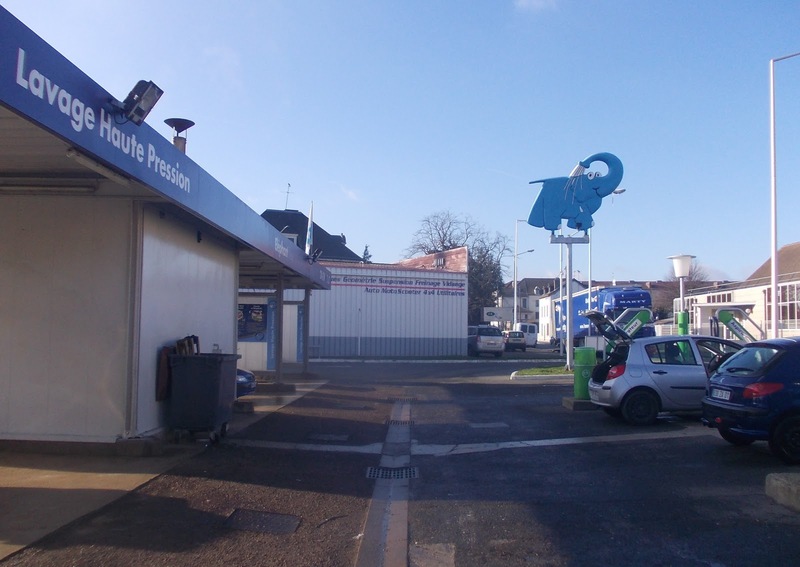 Here's how many French people wash their cars. Wash and vacuum, do-it-yourself. It costs 10€ for five tokens at this chain, Elephant Bleu. And when my car's extra dirty, it may take two tokens to either wash or to vacuum up the bits in between the seats. Not cheap. Lucky me I found one of the tokens on the ground the other day, so I gave my little white Megane an extra-long wash... It's finally free of its grey tinge. I recall paying about $28 for a thorough cleaning and oil change when I lived in New York, but that was a completely different experience from here. We'd wait in a nice clean waiting room watching CNN or some kids' program while the car passed through an automated tunnel. Someone gave it a super-duper high-powered vacuuming, which left not a French fry or McNugget to be found. It came out with that new car smell again. How I miss those days! Here, the oil change would cost more than that. Hugh!!! When are you bringing your concept to France??? ?